The Earth is dying, wrecked and ravaged by humanity. A last group of surviving humans set out on the cargo ship Gilgamesh, beginning a desperate mission to find a new home. Frozen in stasis, they travel for centuries towards a distant solar system and find a wonderful treasure from the past, a planet terraformed and prepared for human life by the humans of the Old Empire. The crew of the Gilgamesh approach the planet with a new sense of hope, only to find that the planet is already occupied by their worst nightmares. This novel spans thousands of years, beginning as the Old Empire approaches its destruction. Doctor Avrana Kern is putting the final touches on Kern’s World, a planet she has designed to harbor a unique form of intelligent life. Disaster strikes when a crew member decides that Kern does not deserve to play god, and sabotages the ship, killing himself and the experiments that were destined for the planet. Avrana Kern finds herself alone in a small satellite, watching her life’s work burn as it enters the planet’s atmosphere. She enters a cryogenic sleep chamber in the hopes that a passing ship will find her at some point in the future. Unknown to her, something has survived the burning of the ship, and will eventually evolve into a new and monstrous form of life. Adrian Tchaikovsky’s science fiction novel can be summed up in three words. Giant. Sentient. Spiders. As a lifelong arachnophobe, the early chapters of Children of Time, with their numerous descriptions of spider legs, spider palps, and spider fangs, gave me the serious creeps. But after the initial ick factor wore off, I found myself oddly intrigued by the descriptions of spider society presented in this novel. The spiders begin to evolve from the simpleminded predators that we have today into a true society. They develop language, culture, and technology that will allow them to contact the Messenger, the satellite orbiting their planet. They also engage in warfare, discover religion (and religious persecution) and begin to unravel the mystery of their own existence. Tchaikovsky should be applauded for his descriptions of the spider civilization. It is no easy task to convincingly write non-humanoid characters that feel “real”, especially if those characters are something that our minds naturally see as disgusting. I haven’t rooted so much for a spider’s well-being since Charlotte’s Web. Another amazing thing about this novel is the way that Tchaikovsky manages to interweave a narrative that spans millennia in a very straightforward and linear fashion. As we watch the spiders evolve and grow their society, we also follow the crew of the Gilgamesh as they develop their own unique culture aboard the ship. Our primary protagonist among the humans is Holsten Mason, the resident “classicist” whose function is to interpret the language of the ancient Old Empire. He emerges from stasis at various intervals throughout time, and watches as the crew of the Gilgamesh fall prey to so many of the same follies that have plagued humanity since the beginning. Arrogance, selfishness, and megalomania are still entrenched in the human psyche, and Mason is there to testify that even though humans have managed to destroy their own planet, they may not have learned from the experience. Many science fiction writers take a rather pessimistic view of mankind, and Tchaikovsky is no exception. He does instill a pervading sense of hope throughout the novel; as flawed as humanity is he definitely sees the possibility of redemption. This was a beautifully written novel that challenges our preconceived notions about what it means to be human. I truly enjoyed this book. 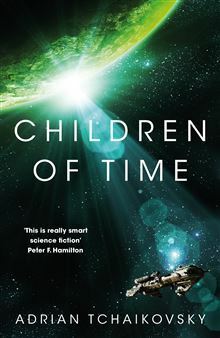 You can find Children of Time here on Amazon or here on Book Depository.